Her laugh saved her life. Galit Avraham, age 46, felt a stabbing pain behind her eye every time she laughed. When a CT scan revealed that the pain was caused by a brain aneurysm, Avraham rushed from her home in Be’er Sheva to Hadassah Hospital Ein Kerem. Prof. Jose Cohen, head of Endovascular Neurosurgery, performed a cerebral catheterization to seal the aneurysm that threatened Avraham’s life. Fifty percent of similar cases end in death. “Avaraham arrived at Hadassah at the last possible moment, and we were able to save her,” reports Prof. Cohen. 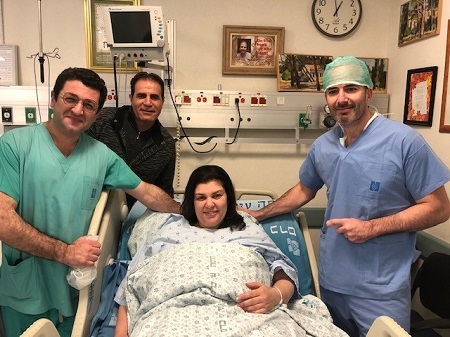 In the picture (from right to left): Prof. Jose Cohen, the patient – Galit Avraham, the patient’s husband – Tzadok Avraham, and the head technician of the unit – Gregory Uryev.